Investment casting is an advanced processing process used to produce metal parts of the highest quality, functionality and cost-effectiveness. Investment casting is the process operated step by step in which one wax pattern produces one metal part. When combined with modern investment casting technologies, investment casting can be applied to produce parts of different degrees of complexity, in virtually any volume and for the broadest possible spectrum of applications. CFS foundry supplies high quality investment castings for a wide range of applications, from agricultural tillage tools, forklift components to sporting equipment, medical appliances, aerospace and many kinds of manufacturing equipment. Our metals engineering specialists are available to discuss investment casting for your part, or suggest closed die forging method which might better meet your part requirements. CFS’ engineering and development can save 30-50% of your casting costs by casting China, while expediting production process. Why Should We Use Investment Castings for The Project? Investment casting produces near-net-shape products from less to no machining. This offers engineers design flexibility in many types of alloys and the capability of producing precise detail and dimensional accuracy in parts weighing from many pounds to just a few ounces. 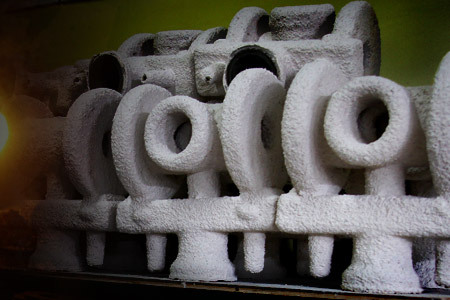 With the exception of tooling for the wax molds, no large capital equipment is needed to produce this type of casting. The reduction or even elimination of machining operations significantly reduce the cost of production. Casting can produce several parts all in one. This replaces the need for fabrication such as welding, thus reducing assembly, handling and inspection costs. Reduction of assembly operations can greatly reduce prices, also the production time can be saved. Investment casting allows for a wide range of metal alloys. Aluminum, steel, and iron can all be used. Since there are so many options (silica sol casting, water glass casting and die casting) when it comes to the material that can be used, it provides the ability to have a wide variety of material characteristics to suit almost any application. If you are still confused if your project should use investment casting, contact us right away, our engineer will offer you the most reasonable suggestion!